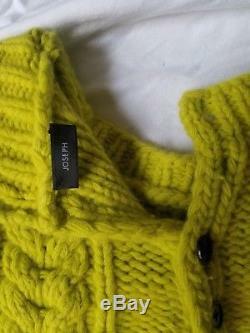 Gorgeous Wool and Cashmere Sweater from renowned London label, JOSEPH. 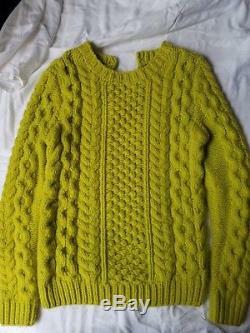 Fabulous cable knit sweater - classic with a twist - in a gorgeous neon yellow-green color. Size Large but fits more like a medium. 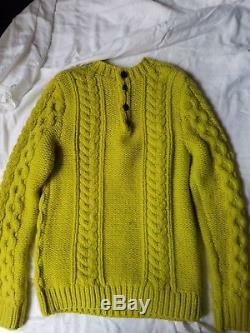 The item "JOSEPH Cable Knit Wool and Cashmere Sweater in Bright Lime, size L (slim fit)" is in sale since Wednesday, October 10, 2018. This item is in the category "Clothing, Shoes & Accessories\Women's Clothing\Sweaters". The seller is "gemini5.2012" and is located in New York, New York. This item can be shipped to United States, Canada, United Kingdom, Denmark, Romania, Slovakia, Bulgaria, Czech republic, Finland, Hungary, Latvia, Lithuania, Malta, Estonia, Australia, Greece, Portugal, Cyprus, Slovenia, Japan, China, Sweden, South Korea, Indonesia, Taiwan, Thailand, Belgium, France, Hong Kong, Ireland, Netherlands, Poland, Spain, Italy, Germany, Austria, Israel, New Zealand, Philippines, Singapore, Switzerland, Norway, Saudi arabia, Ukraine, United arab emirates, Qatar, Kuwait, Bahrain, Croatia, Malaysia, Brazil, Chile, Colombia, Costa rica, Dominican republic, Panama, Trinidad and tobago, Guatemala, El salvador, Honduras, Jamaica.